The regular email and photo updates really where a godsend! I was quite worried to leave Sophie on her own with a stranger – as she can be quite a nervous cat. But when I returned from holiday she was totally relaxed, and maybe even more playful than usual (Anita had brought several new toys with her for Sophie to play with). Catnips provides a professional and trustworthy service in excess of what I expected and I wouldn’t hesitate to recommend. 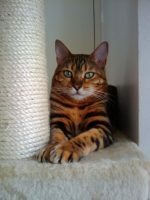 If you have found yourself on this page and have read the above Cat sitting Bayswater – Sophie, are a cat guardian and live in Bayswater l then it’s more than likely that you will be seeking a cat sitter to care for your cat during your travels. 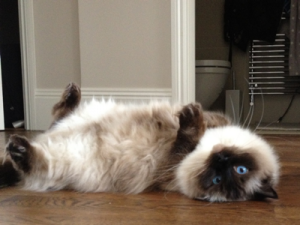 Sophie was happy with her Cat sitting Bayswater – Sophie. You and your cat will be too! WHY SHOULD CATS STAY IN THEIR OWN HOME? Cats are territorial and territory is everything to them. Therefore removing your cat to a cattery or to be boarded in another home (both unfamiliar territory) is stressful for cats. The best option a cat owner has to is hire a cat sitter to visit the home everyday or to hire a live in cat sitter.